At the Center for Geospatial Analytics, one of our strengths is developing dynamic spatial-temporal models that help researchers and other stakeholders explore scenarios of alternative futures, to reveal tradeoffs and uncertainties. We aspire to cultivate an open source community of users and developers who will advance these models and their applications. FUTURES, or FUTure Urban-Regional Environment Simulation, is an open source urban growth model designed to address the regional-scale ecological and environmental impacts of urbanization. It is one of the few land change models developed to explicitly capture the spatial structure of development. 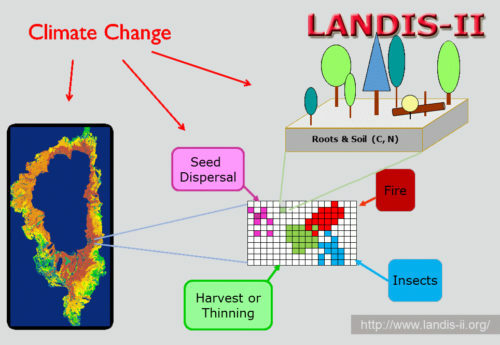 The LANDIS-II model simulates landscape change as a function of disturbance (e.g., fire, wind, insects), forest management, land use change, and succession. Climate change effects are integrated throughout the model. The model is highly customizable with dozens of libraries ('extensions') to choose from. PoPS, the Pest or Pathogen Spread simulation, predicts the spread of invasive plant pathogens and insect pests across large landscapes. Stakeholders will use these models in serious games to support collaborative decision-making for management action. 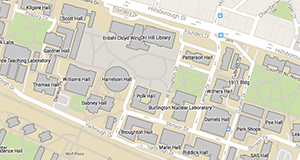 The next LANDIS-II user training will be May 30-31, 2019 at North Carolina State University in Raleigh, NC. The training is fast-paced and hands-on. The cost for the two-day training will be $200 (check or PayPal). Training includes 8 hours/day of training, lunch, coffee, snacks and a copy of the LANDIS-II Exercise book. Seating is limited! All of the landscape forecasting models at the Center for Geospatial Analytics are open source and continue to expand and improve. We invite you engage with our user/developer communities and help us learn from each other. Join us on the FUTURES online forum to ask questions, connect with the development team, receive announcements and contribute to discussions. Visit the FUTURES webpage for more information. The LANDIS-II community is very active with hundreds of users and developers worldwide. We welcome anyone to join the LANDIS-II community and to contribute. All model components are free and open-source. There are active bulletin boards for Users and Developers. And there are meetings and trainings held every year in various locations across the US and Canada. Please visit www.landis-ii.org for further information. A new study by Francesco Tonini and colleagues presents the Base Epidemiological Disturbance Agent (EDA) extension, which allows users of the LANDIS‐II forest landscape simulation model to simulate forest pathogen spread and host mortality within a spatially explicit forest simulation.